The Zoosters from New York are planning to do a lot of sightseeing in Europe when their circus troupe tours it in June. To prepare for the trip, they’ve collected the temperature predictions for the cities they’re planning to visit. But the New Yorkers aren’t used to using the Celsius scale. 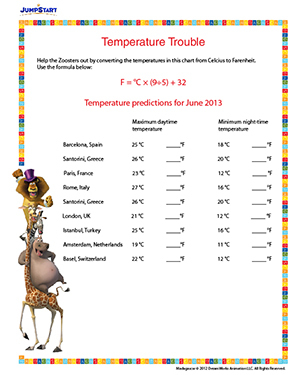 Help them make sense of the temperature predictions by converting the values to Fahrenheit. Use the formula at the top of the worksheet for help. This free science worksheet is great for 6th grade.